Real estate is a rapidly growing industry with various individuals and companies looking to invest. Since the process is rather complex, it involves stakeholders such as the clients, real estate agents, authority and financial institutions. Mortgage lenders have a crucial role to play since many of the real estate transactions are not on cash basis. Mortgage lenders and real estate agents need one another in order to accomplish smooth operations. Although it is the responsibility of both parties to establish good relationships, there are five ways a mortgage lender can work better with real estate agents. Communication is key in all aspects of life. Since the process of loan approval takes various steps, the loan officer should take the initiative to inform the real estate agent of progress or new developments. It may not be easy for the agent to understand the process. However, make a point to communicate on a regular basis. Furthermore, schedule calls and meetings after a pre-determined time for updates. Frequent communication helps to build confidence in the mortgage lending company such as www.quantumfinance.com.au which means more referrals leading to growth. Another important thing when communicating is to ensure the information you pass during the updates, as a mortgage lender, is helpful. As much as we would want to be successful in ensuring the approval of loans for all clients, it is not possible. The lending industry is complicated and unpredictable. The situation differs from one client to another since the considerations are different. Beforehand, be open about this to the real estate agent and explain all the possible outcomes. A reasonable individual understands that there are always risks. Also, work to reduce any instances that may lead to the process being unsuccessful. For example, ensuring all documentation is available and accurate, ensuring compliance with requirements. Avoid making promises that you can’t keep and be objective. Not everyone is easy to work with. As a result, conflicts may arise often. However, you as the mortgage lender can control this by establishing objectives that you have in common with the real estate agents. Before proceeding with the process, discuss the outcome that sits well with the two parties. After this is done, create a plan on how to work towards it. According to statistics, a higher success rate is recorded when people are working towards a similar objective. A similarity in objectives creates a drive and focus to work for fulfilment making all parties satisfied. When making your presentation to the real estate agents, be factual. Avoid making unrealistic promises and terms that you are not certain you can deliver. For example, never promise that the loan will go through and you have no control over the process. Remember, the industry is unpredictable and there are lots of issues to consider. Instead, be realistic and offer guidance to increase the success rate. In this way, both parties will be okay no matter the outcome. There is no better way for individuals to work together than in sharing helpful information. As a mortgage lender, build a better relationship by educating them on matters in the finance industry that affect them. It might be in the form of new legislation passed, informational articles on social media or current trends. Also, give yourself the opportunity to learn from the real estate agents to increase knowledge base. This not only helps to build the relationship but increases the likelihood of wanting to work together which is a win for all parties. 2. Sift dry ingredients together in a large bowl. 3. “Snap” the butter into your flour mixture. Literally pick up the small chunks of flour covered butter and snap them between your fingers. This will flatten each little piece of butter but keep the butter “in tact” so you will be able to taste it in your biscuits. Don’t try to cream the butter into your dough. You can see the butter in my dough in the picture above. 4. Add buttermilk until it’s just combined. Do not over mix. Dough should be very sticky. 5. 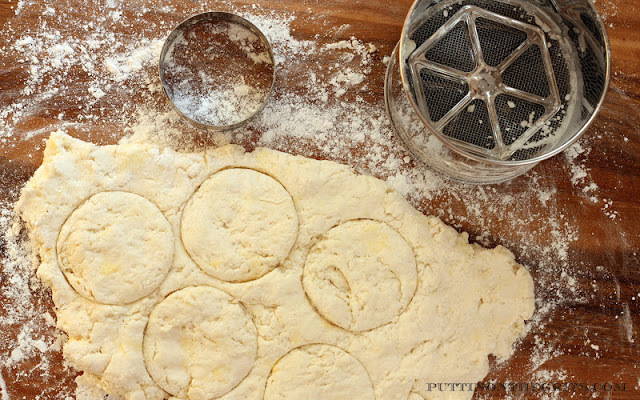 Turn dough out onto a floured dough board and gently press it to 1/2″ thick. Do not use rolling pin. It should be lumpy and bumpy! Fold the dough in half and gently press it together again (don’t press together too much…that “fold” is what makes them easy to split open once they’re baked!). Fold it in half one of more time and press it out to 1″ thick. 6. Using a biscuit cutter, cut into rounds. 7. You can use the scraps but they will not be nearly as good as the original biscuits. 8. Place biscuits on a cookie sheet- if you want soft sides and “taller” biscuits, make all of the sides touch on the baking sheet. If you want “crunchy” edges, don’t let them touch. 9. Bake approximately 10 minutes until golden brown. I obviously baked mine without the sides touching which is why they aren’t as tall as you’re probably used to seeing them. The insides are still incredibly fluffy and perfect, they just have a nice “crust” on the outside which I personally love. 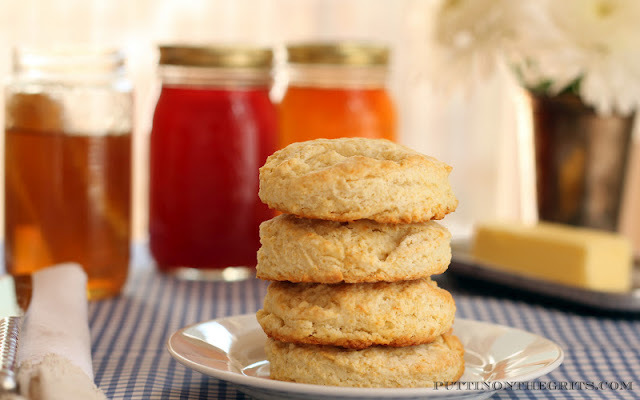 I love biscuits and honey…especially this honey from the Blue Ridge Mountains. I swear the taste better if the honey is dripping down between your fingers.